Crude markets continue to move higher as investors hope for the trade talks between the US and China to come to a positive conclusion. On top of that, the continued restriction by the OPEC+ on production limits could see prices forcing higher as markets recover from the oversupply fears with the US API weekly stockpiles dipping from the previous -4.6M barrel to -6.27M barrel. As expected, Crude prices surged and broke above the $50 level after penetrating the trend line presented on the chart. 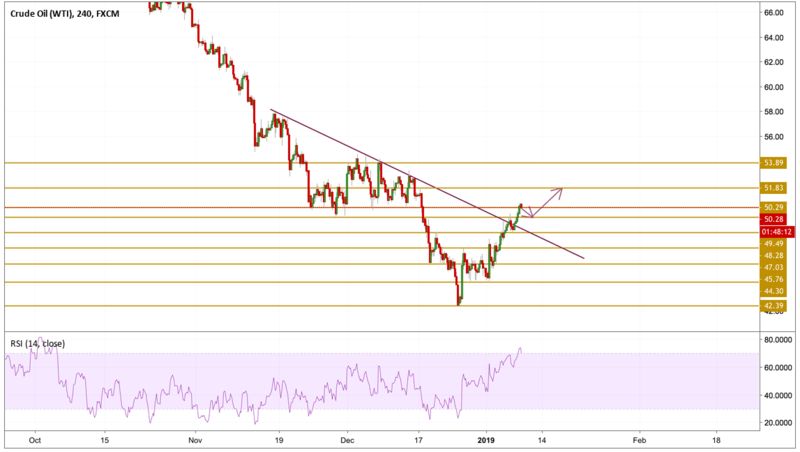 The price is currently hovering just below the $50.29 resistance level after facing overbought conditions as the RSI reveals. A retest of the previous $49.5 resistance-turned-support level is more likely to happen before we see a continuation of the upwards move. The next level we will be watching is the $51.83 level.